Film is not about having a big name in it to sell it to a wide audience, but a strong and compelling story that we would like to see in it. Saying that, there are only few filmmakers whose film I would run to watch even when there is no George Clooney, Julia Roberts, Jack O’Connell or Dominic West casted in it – it’s Jodie Foster‘s. But having all above names in one film certainly is a great bonus, but means nothing when you have Jodie Foster as the director of MONEY MONSTER. 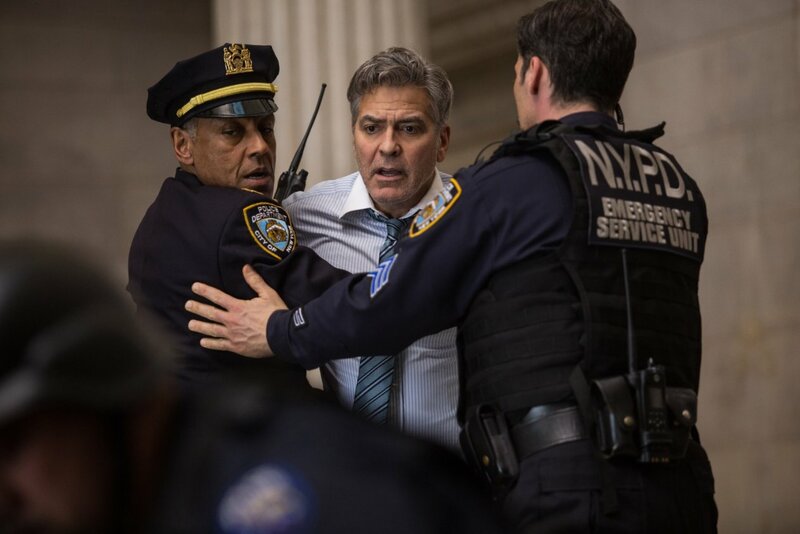 MONEY MONSTER follows a financial TV host Lee Gates (George Clooney) and his producer Patty Fenn (Julia Roberts) who are put in a dangerous situation when their studio is taken over by a nothing-to-lose young man, Kyle Budwell. Soon after when they listen to the story of Kyle, the two realize that the man had his own reason to take such a radical action to prove to a nation that the finance world plays with their trust to steal their money with the help of “computer glitch”. It takes about twenty decent minutes to build up the story that will keep you at the edge of your seat. While the fan part happens in the beginning when Lee Gates dances live on TV, it’s what happens afterwards that will make you think throughout the film. Certainly hostages, financial crisis, police that shut down the New York City, computer bugs are popular subject nowadays, but how you bring it up in one film is what matters when you see it in MONEY MONSTER. Once Kyle explains his reasons to attack the studio, Patty and Lee understand the importance of the answers they must get when they engage Diane Lester, an IBIS employee, who knows how to reach out the real cause of all the nightmare the studio had to go through – Walt Camby (Dominic West). As the story unfolds, you find out that many people were affected by a computer glitch that somehow causes the loss of savings of ordinary people. Kyle, who appears as a villain in the beginning quickly turns into a national hero who alone fights against a corporation that plays a dangerous game with people’s trust. A conspiracy type of film is something new for Jodie Foster, but I must say, she handles it well. In MONEY MONSTER she gives you everything you need to enjoy it, but more importantly provides you food for thought, which I am sure, you will find amusing to discuss afterwards. The best part of her film is when you realize that once manipulated, the same mind can’t be manipulated twice, and that sometimes a radical approach is the only way to bring justice. This film is not about that something fishy always going on behind the curtain, but it’s about to be more careful when it comes to investing your own money into something that gives no guarantee of tomorrow.